...my daughters, my husband, my entire family with my sister and her family, all my Uncles, Aunts and Cousins. I am thankful for the time I had with my Mum before she passed away. I am thankful for my friends. I am thankful for being able to create and for my lovely home. I am thankful for all of you my lovely fellow bloggers and so much more. I wish you all a day filled with fun, laughter, friends and family and good food! My day will be spent with my two daughters and our cats, since my husband is away with work. From my home to yours where ever you are have a wonderful day! 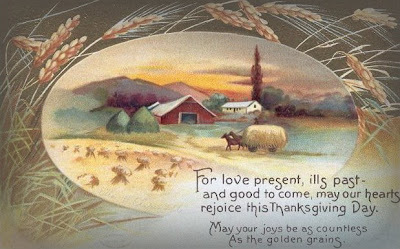 Have a lovely Thanksgiving. It's one of my favorite holidays. Happy Thanksgiving to you! That postcard is so pretty! Have a wonderful day Karen, what a beautiful post. 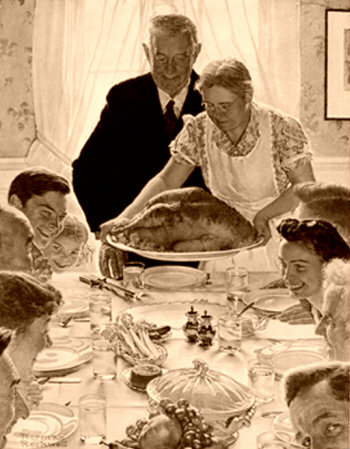 That is one of my favorite Norman Rockwell pictures. Happy Thanksgiving!